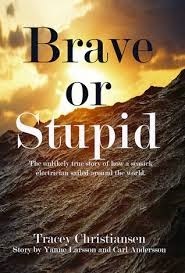 Brave or Stupid, story by Yanne Larson and Carl Anderson, is the true story of two friends who set out on a three-year sailing trip around the world. The most amazing thing about this story is it’s two average guys who set sail. They came up with the idea while at a boozy picnic in Normandy. As the reader, you get an inside look at the development of this journey, from learning to sail to crossing the high seas. With descriptive and sometimes humorous writing, the narrator documents the journey, which turns out to be an adventure that no one could have anticipated, complete with love, illness, and other surprises. If you’re a fan of adventure or are just someone who dreams of dropping everything and doing something crazy, you must buy this book!